Mix together both flours, salt, cinnamon, baking soda and baking powder. Set aside. Break up the graham crackers into small pieces. Be careful to not let it get too powdery, but some graham cracker powder is okay. Set aside. Cream the butter and sugar together until fluffy. Slowly add the eggs one at a time, then the vanilla. Slowly add the flour mixture until just incorporated. Fold in the graham crackers and chocolate. Take a tablespoon of the cookie and create a small indentation. Stuff 4 – 5- mini marshmallows into the indentation. 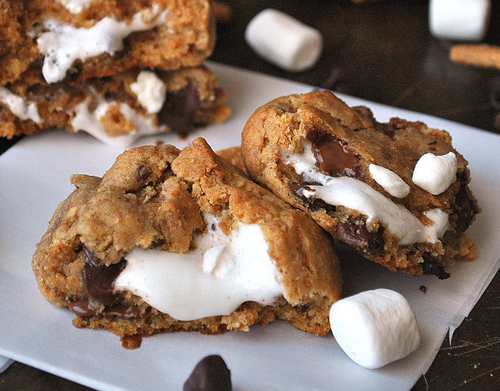 Top with another ⅔ tablespoon of cookie dough and press together until the dough completely covers the marshmallows. Repeat with the remaining dough and marshmallows. Place the cookies on a baking sheet and cover. Cover with plastic wrap and chill in the refrigerator overnight, up to three days. Uncover the cookies and bake for 8 – 9 minutes or until a light golden brown. Use a spatula to immediately remove the cookies to cool on a wire rack. For the best results, place the cookies near a fan to cool them quickly. Serve immediately or store in an airtight containter and enjoy within 24 hours.